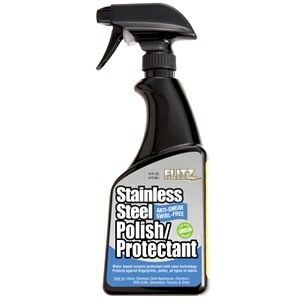 The Flitz Stainless Steel & Chrome Polish produces a showroom shine on both brushed and polished stainless steel surfaces. The water-based formula means no oily residue, resulting in a fabulous streak-free finish. Just spray and wipe stainless steel appliances, gas grills or vent hoods for a fingerprint and dust resistant appearance. For best results, use Flitz Stainless Steel & Chrome Cleaner before applying this product. Avoid direct contact with foods. 16 oz. spray bottle. Made in the USA.